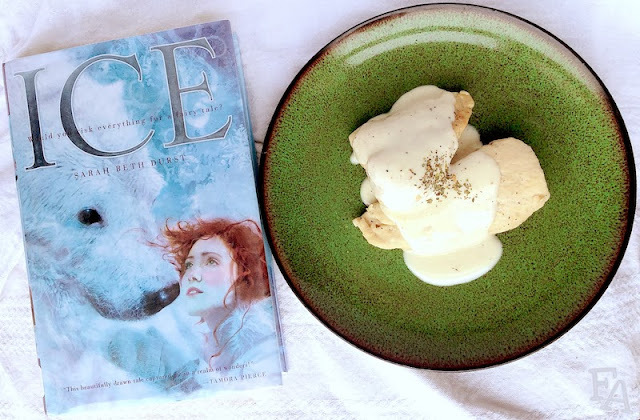 Book Adventures: Revisiting Ice by Sarah Beth Durst—with a Recipe! Revisiting Ice by Sarah Beth Durst—with a Recipe! I posted about Sarah Beth Durst's wonderful young adult fantasy novel Ice a while ago (see post here), but I recently came up with a recipe for the favorite food of the main character, Cassie! It's wine soaked chicken. I also created a wine cream sauce for it (because I love creamy, and I thought it went well with the snowy/icy setting). There's also a non-alcoholic version of the recipe (because alcohol doesn't completely cook off, you know). I hope you enjoy it! Please click the image below for the recipe.